Stay Safe: There are steep cliffs at this park. Please do not climb over the chain link fence. Watch children closely. Fences are provided only near the parking area and lookout. Hike at your own risk. 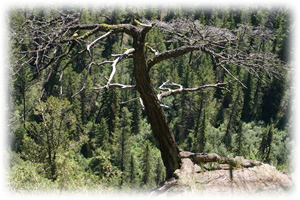 The park conserves forests of ponderosa pine at the northern limit of its range, and diverse low elevation lakes and marshes. The uplands, marshes, and lakes are rich ecosystems supporting abundant wildlife. A spectacular display of colour illustrates the park’s rich geology in the Chasm Creek Valley and part of the Bonaparte River Valley. Successive lava flows form layers in varying tones of red, brown, yellow and purple, which have been revealed in the steep lava-layered canyon walls through erosion over the past 10 million years. At the end of the last ice age, 10,000 years ago, water from the melting glaciers carried so much silt that it carved the 8 km long, 600-metre wide and 300-metre deep Chasm. An esker (ridge of gravel) formed by the glacier stretches 40 km upstream, northwest from the head of the Chasm. Chasm Provincial Park protects the unique river canyon of the Chasm Creek Valley and part of the Bonaparte River Valley. In 1995, the park was recommended for expansion through the Cariboo Chilcotin Land-Use Plan. It was enlarged from 141 hectares to 3067 hectares to protect more of the area’s colourful geological formations and ponderosa pine forests. The unique features of Chasm Provincial Park offer hiking opportunities and spectacular backdrops for the avid photographer. Facilities include a pull out viewing area and a larger parking area with a toilet. The park is located along Chasm Creek. It can be accessed by taking Highway 97 to 16 km north of Clinton, and then driving 4 km to the park on a paved road east of Highway 97. It can also be accessed from further north off Highway 97 about 15 km southwest of 70 Mile House. Please refer to the Cariboo Forest Region Recreation Map (East) published by the Ministry of Forests for more information. Topographical map number 1:50,000 92P/3 shows land contours in detail. The closest communities, towns and cities are 70 Mile House, 100 Mile House and Clinton. History: This park was established in 1940 to protect the Painted Chasm. In 1995, the park was recommended for expansion through the Cariboo Chilcotin Land-Use Plan. It was enlarged from 141 hectares to 3067 hectares to protect more of the area’s colourful geological formations and ponderosa pine forests. At the end of the last ice age, 10,000 years ago, water from the melting glaciers carried so much silt that it carved the 8 km long, 600 m wide and 300 m deep Chasm. An esker (ridge of gravel) formed by the glacier stretches 40 km upstream, northwest from the head of the Chasm. Layers of volcanic lava can be distinguished in the steep canyon walls. Conservation: Chasm Provincial Park protects a lava-layered canyon formed by glacial melt water erosion. The park also conserves forests of ponderosa pine at the northern limit of its range, and diverse low elevation lakes and marshes. The uplands, marshes, and lakes are rich ecosystems supporting abundant wildlife. Wildlife: Bighorn sheep inhabit the steep wall of the canyon. Moose, mule deer, black bear, coyote, small mammals, songbirds and birds of prey inhabit this area. Cycling is permitted. Bicycles must keep to roadways. Bicycle helmets are mandatory in British Columbia. This park has informal hiking trails (generally following old roads – there are no signs to mark the routes). An old road, which leads along the southern edge of the chasm, offers occasional spectacular views and a very pleasant experience of dry pine and fir forest. There are steep cliffs at this park. Watch children closely. Fences are provided only near the parking area and lookout. Hike at your own risk. There are horseback riding opportunities in this park. There is a viewpoint. The view is of a spectacular display of colour which illustrates the park’s rich geology in the Chasm Creek Valley and part of the Bonaparte River Valley. Successive lava flows form layers in varying tones of red, brown, yellow and purple, which have been revealed in the steep lava-layered canyon walls through erosion over the past 10 million years. There is a viewpoint and parking area for day-use activities, but no developed picnic area. The view is a spectacular display of colour illustrating the park’s rich geology in the Chasm Creek Valley and part of the Bonaparte River Valley. Successive lava flows form layers in varying tones of red, brown, yellow and purple, which have been revealed in the steep lava-layered canyon walls through erosion over the past 10 million years.